There’s a growing trend for incorporating a love of fitness into the world of luxury yachting, shown most strongly in the development of superyacht gyms. What was once considered a bonus room, the on board gym has become an essential design feature and one that can make or break your chances of chartering out your yacht. We bring you four tips for designing the best superyacht gym, which starts with dedicating a space to working out. Personal preference will dictate where is best to place your gym, but what’s most important is you find a dedicated space for this. You could simply section out part of the beach club, give the gym its own room on one of the decks or even choose an area outside to exercise in. The gym on Lady Britt makes the best of both worlds with a bright, spacious design and wide views of the sea. There’s a growing trend for incorporating a love of fitness into the world of luxury yachting, shown most strongly in the development of superyacht gyms. What was once considered a bonus room, the on board gym has become an essential design feature and one that can make or break your chances of chartering out your yacht. We bring you four tips for designing the best superyacht gym, which starts with dedicating a space to working out. Personal preference will dictate where is best to place your gym, but what’s most important is you find a dedicated space for this. You could simply section out part of the beach club, give the gym its own room on one of the decks or even choose an area outside to exercise in. 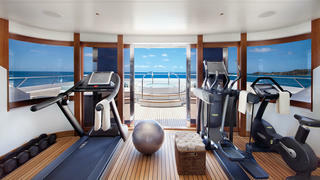 The gym on Lady Britt makes the best of both worlds with a bright, spacious design and wide views of the sea. The layout of your superyacht gym is everything – it’s important for safety and stability, it ensures comfort and it boosts your enjoyment of exercising on board. If you opt for an indoor gym on your luxury yacht, it’s important to consider the overhead height available, especially when incorporating cardio machines. If you’re choosing an outdoor gym, like the one on Turquoise above, you need to consider where the equipment will be stowed when underway. But regardless of whether you have an indoor or outdoor superyacht gym, it's important to be aware that larger pieces must be properly affixed to the floor, and smaller items such as free weights should be housed in custom storage, which will affect the layout of your gym. You must also be careful to not fill the entire space with equipment; make sure you have adequate floor space for yoga and stretching exercises, as this widens the appeal of the superyacht gym and makes it more useful for everyone on board. Selecting the best exercise equipment for your on board gym is nearly as important as designing the right workout space. The choice, range and positioning of the equipment must not only cater to the space available, but also to the health requirements of the owner and guests. You want to end up with a well equipped gym, like the one on Just J's pictured above. The best advice is to go for a variety of cardio, such as a rower, jogger or spin bike and a crosstrainer, as well as a good selection of free weights, especially the lighter weights. Durability and ease of maintenance are additional considerations for superyacht gym equipment, given the nature of the space and hygienic needs. And don’t forget the basic equipment needs: towels, a refrigerator and cold water are the finishing elements to round out your well-designed on-board workout space. Selecting the best exercise equipment for your on board gym is nearly as important as designing the right workout space. The choice, range and positioning of the equipment must not only cater to the space available, but also to the health requirements of the owner and guests. You want to end up with a well equipped gym, like the one on Just J's pictured above. The best advice is to go for a variety of cardio, such as a rower, jogger or spin bike and a crosstrainer, as well as a good selection of free weights, especially the lighter weights. Durability and ease of maintenance are additional considerations for superyacht gym equipment, given the nature of the space and hygienic needs. And don’t forget the basic equipment needs: towels, a refrigerator and cold water are the finishing elements to round out your well-designed on-board workout space. 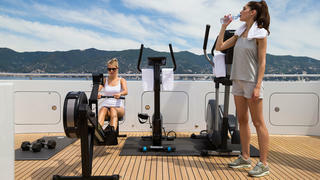 Establishing a positive environment that lends itself to exercising is key to designing a good superyacht gym. You can do this by avoiding harsh downlighting, ensuring adequate ventilation and air conditioning and positioning the equipment so that the transition between exercises is easy and seamless. Exceptional audio-visual is another key component to an on board gym – especially one that might not otherwise offer an unobstructed sea view. Ensure that the TVs are easily visible from all areas of the space and that they are wall-mounted versus built-in, as the latter are difficult to maintain while at sea. Grace E does this well with her on board gym. 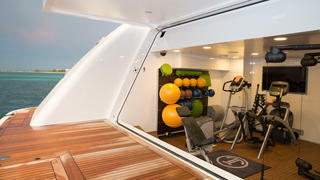 Establishing a positive environment that lends itself to exercising is key to designing a good superyacht gym. You can do this by avoiding harsh downlighting, ensuring adequate ventilation and air conditioning and positioning the equipment so that the transition between exercises is easy and seamless. Exceptional audio-visual is another key component to an on board gym – especially one that might not otherwise offer an unobstructed sea view. Ensure that the TVs are easily visible from all areas of the space and that they are wall-mounted versus built-in, as the latter are difficult to maintain while at sea. Grace E does this well with her on board gym.